Sparkling white gold stands out in this stunning small custom initial heart necklace in 14K white gold from Apples of Gold Jewelry. With a metal that matches a variety of other jewelry items and clothing, this lovely heart will remind her of how important she is to you. 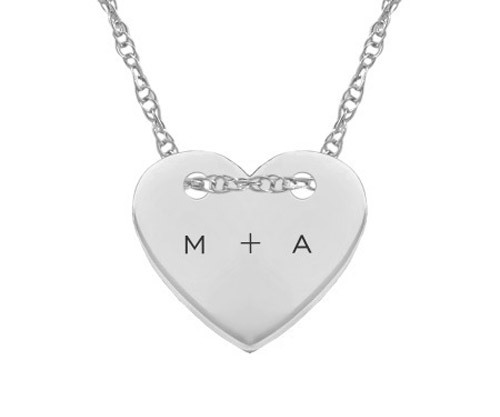 The heart shaped pendant can fit up to 8 engraved characters, including spaces, so you can make this necklace even more special. The pendant measures 11mm by 10mm in size (0.43 inches by 0.39 inches) and fits perfectly with the included 18 inch chain. We guarantee our Small Custom Initial Heart Necklace, 14K White Gold to be high quality, authentic jewelry, as described above.